Some of my faithful visitors may have noticed that I have a thing for Vim, one of the oldest and most powerful text editors in the world. In the past 15 or so years that I've been developing, I have spent quite a bit of time in several different text editors. It seemed like I was continually on the quest to find the fastest, most feature-packed editor out there, while still being cross-platform compatible and having it stay out of my way. Speed has always been very important to me. I have been using Vi and Vim regularly since about 2000, when I began dabbling with Linux. I could certainly hold my ground in either of the two programs, but I was by no means proficient. The more appealing text editors for me offered syntax highlighting and code completion. At the time, I was under the impression that Vi/Vim didn't offer either of these two features. It wasn't until around the middle of last year, however, that I really started putting effort into learning and using Vim. After asking some of my Vim-savvy friends a lot of questions to get me kickstarted, I began to see the power that lies in Vim. Before long, Vim had replaced all other text editors as my preferred editing environment. I learned that Vim could satisfy just able every single one of my personal qualifications for the perfect editor. I dumped all other editors in favor of Vim, and I even opted to use Vim over a several hundred dollar IDE at work. Anyway. I received a review copy of Kim Schulz' "Hacking Vim: A cookbook to get the most out of the latest Vim editor" a couple of months ago and have been rummaging through it since then. I have learned a ton of fantastic tips from this little book! Being a cookbook, you're not expected to read the entire book start to finish. Rather, you can dig right into whatever section interests you and feel right at home. New users join the Vim user community every day and want to use this editor in their daily work, and even though Vim sometimes can be complex to use, they still favor it above other editors. This is a book for these Vim users. Chapter 5 introduces some advanced formatting tips. You can learn how to put text into nicely-formatted paragraphs, aligning text, marking headlines, and creating lists. For code, this chapter discusses several different indentation options. Appendix A describes how Vim can be used for much more than just text editing. Several different games, including Tetris and a Rubik's Cube are briefly introduced, along with how to use Vim as a mail client or programmer's IDE. Appendix B suggests miscellaneous configuration script maintenance tips, such as how you can maintain the same configuration script across several different machines. I was very impressed with this book. I was afraid that, being published in 2007, it might be a little too out-of-date for my personal tastes. Since the book is about Vim, though, I wasn't overly concerned (the editor has been around for decades, and it doesn't change drastically from release to release anymore). Just like the last book I reviewed, I found several typos in this book. A lot of the typos were in the first few pages of the actual content, and some were definitely more minor than others. This sort of thing doesn't really detract much from the material covered, but it sure does stand out as a distraction for people who pay attention to details. I knew about the lowercase variations of these commands, but not the uppercase. I learned that this even works on Python imports! Just like the description says, it will work on the import module, not classes or other objects from inside the module. Not quite that intelligent! I knew about the usual # and *, but those two will only match the same exact word. When they're prefixed with g, they will match any occurrence of the word, be it whole or part of another word. For example, hitting g* while the cursor is over the word foo would would match both food and foobar, while * would match neither. :autocmd FileType xml exe ":silent 1,$!tidy --input-xml true --indent yes -q"
:autocmd FileType html,htm exe ":silent 1,$!tidy --indent yes -q"
All in all, this is a fantastic book. I will be keeping it near my workstation as a quick reference book when I want to do something crazy with Vim. I've already recommended the book to several of my friends and acquaintances, and I will make the same recommendation here. If you are mildly familiar with Vim and at all interested in getting more out of this fabulous editor, I highly recommend picking up a copy of this book. Several months ago, a UK-based book publisher, Packt Publishing contacted me to ask if I would be willing to review one of their books about Django. I gladly jumped at the opportunity, and I received a copy of the book a couple of weeks later in the mail. This happened at the beginning of September 2009. It just so happened that I was in the process of being hired on by ScienceLogic right when all of this took place. The subsequent weeks were filled to the brim with visitors, packing, moving, finding an apartment, and commuting to my new job. It was pretty stressful. Things are finally settling down, so I've taken the time to actually review the book I was asked to review. I should mention right off the bat that this is indeed a solicited review, but I am in no way influenced to write a good or bad review. Packt Publishing simply wants me to offer an honest review of the book, and that is what I indend to do. While reviewing the book, I decided to follow along and write the code the book introduced. I made sure that I was using the official Django 1.0 release instead of using trunk like I tend to do for my own projects. This book is for web developers who want to learn how to build a complete site with Web 2.0 features, using the power of a proven and popular development system--Django--but do not necessarily want to learn how a complete framework functions in order to do this. Basic knowledge of Python development is required for this book, but no knowledge of Django is expected. Ayman introduced Django piece by piece using the end goal of a social bookmarking site, a la del.icio.us and reddit. In the first chapter of the book, Ayman discussed the history of Django and why Python and Django are a good platform upon which to build Web applications. The second chapter offers a brief guide to installing Python and Django, and getting your first project setup. Not much to comment on here. Chapter three is where the reader was introduced to the basic structure of a Django project, and the initial data models were described. Chapter four discussed user registration and management. We made it possible for users to create accounts, log into them, and log out again. As part of those additions, the django.forms framework was introduced. In chapter five, we made it possible for bookmarks to be tagged. Along with that, we built a tag cloud, restricted access to certain pages, and added a little protection against malicious data input. Next up was the section where things actually started getting interesting for me: enhancing the interface with fancy effects and AJAX. The fancy effects include live searching for bookmarks, being able to edit a bookmark in place (without loading a new page), and auto-completing tags when you submit a bookmark. This chapter really reminded me just how simple it is to add new, useful features to existing code using Django and Python. I was thoroughly impressed at how easy it was to add the AJAX functionality mentioned above. Auto-completing the tags as you type, while jQuery and friends did most of the work, was very easy to implement. It made me happy. Chapter seven introduced some code that allowed users to share their bookmarks with others. Along with this, the ability to vote on shared bookmarks was added. Another feature that was added in this chapter was the ability for users to comment on various bookmarks. The ridiculously amazing Django Administration utility was first introduced in chapter eight. It kinda surprised me that it took 150 pages before this feature was brought to the user's attention. In my opinion, this is one of the most useful selling points when one is considering a Web framework for a project. When I first encountered Django, the admin interface was one of maybe three deciding factors in our company's decision to become a full-on Django shop. Anyway, in chapter nine, we added a handful of useful "Web 2.0" features. RSS feeds were introduced. We learned about pagination to enhance usability and performance. We also improved the search engine in our project. At this stage, the magical Q objects were mentioned. The power behind the Q objects was discussed very well, in my opinion. In chapter 10, we were taught how we can create relationships between members on the site. We made it possible for users to become "friends" so they can see the latest bookmarks posted by their friends. We also added an option for users to be able to invite some of their other friends to join the site via email, complete with activation links. Finally, we improved the user interface by providing a little bit of feedback to the user at various points using the messages framework that is part of the django.contrib.auth package in Django 1.0. More advanced topics, such as internationalization and caching, were discussed in chapter 11. Django's special unit testing features were also introduced in chapter 11. This section actually kinda frustrated me. Caching was discussed immediately before unit testing. In the caching section, we learned how to enable site-wide caching. This actually broke the unit tests. They failed because the caching system was "read only" while running the tests. Anyway, it's probably more or less a moot point. Chapter 11 also briefly introduced things to pay attention to when you deploy your Django projects into a production environment. This portion was mildly disappointing, but I don't know what else would have made it better. There are so many functional ways to deploy Django projects that you could write books just to describe the minutia involved in deployment. The twelfth and final chapter discussed some of the other things that Django has to offer, such as enhanced functionality in templates using custom template tags and filters and model managers. Generic views were mentioned, and some of the other useful things in django.contrib were brought up. Ayman also offered a few ideas of additional functionality that the reader can implement on their own, using the things they learned throughout the book. Overall, I felt that this book did a great job of introducing the power that lies in using Django as your framework of choice. I thought Ayman managed to break things up into logical sections, and that the iterations used to enhance existing functionality (from earlier chapters) were superbly executed. I think that this book, while it does assume some prior Python knowledge, would be a fine choice for those who are curious to dig into Django quickly and easily. Some of the beefs I have with this book deal mostly with the editing. There were a lot of strange things that I found while reading through the book. However, the biggest sticking point for me has to do with "pluggable" applications. Earlier I mentioned that the built-in Django admin was one of only a few deciding factors in my company's choice to become a Django shop. Django was designed to allow its applications to be very "pluggable." You may be asking, "What do I mean by 'pluggable'?" Well, say you decide to build a website that includes a blog, so you build a Django project and create an application specific to blogging. Then, at some later time, you need to build another site that also has blog functionality. Do you want to rewrite all of the blogging code for the second site? Or do you want to use the same code that you used in the first site (without copying it)? If you're anything like me and thousands of other developers out there, you would probably rather leverage the work you had already done. Django allows you to do this if you build your Django applications properly. This book, however, makes no such effort to teach the reader how to turn all of their hard work on the social bookmarking features into something they could reuse over and over with minimal effort in the future. Application-specific templates are placed directly into the global templates directory. Application-specific URLconfs are placed in the root urls.py file. I would have liked to see at least some effort to make the bookmarking application have the potential to be reused. Finally, the most obvious gripe is that the book is outdated. That's understandable, though! Anything in print media will likely be outdated the second it is printed if the book has anything to do with computers. However, with the understanding that this book was written specifically for Django 1.0 and not Django 1.1 or 1.2 alpha, it does an excellent job at hitting the mark. Welcome to my second article about installing Slackware on an Asus EeePC. This is a follow-up article to the one I posted in May 2008 soon after Slackware 12.1 was released. In this article, I will assume that you're doing a fresh installation of Slackware 12.2 and that you have access to an external USB CD/DVD ROM drive. In all honesty, the installation process is extremely similar to what I did with 12.1. However, looking back at my previous article, I realize that my steps may not have been the most useful in the world. This time around I will try to be more helpful. The first, and most obvious step, is to get a copy of Slackware. Simply head on over to http://www.slackware.com/getslack/ and retrieve the appropriate ISO(s) using whichever method you prefer. I downloaded the DVD version of Slackware. If you download the CD ISOs, you really only need the first 3 ISOs. The remaining 3 are source packages for the binary packages you install from the first three discs. Rarely do you need the source code for these packages. After retrieving the Slackware ISO(s), you must burn them to a disc of some sort: ISOs that are ~650MB should be burned to CDs and anything larger should (obviously) be burned to a DVD. Be sure you burn each ISO using the "burn disc image" functionality in your disc writing software--simply burning the ISO file onto the disc in a regular data session will not do what we need. After you have a good copy of the installation disc (the DVD or the first of the CDs), put the disc into your CD/DVD ROM drive and reboot your computer. To ensure that your computer boots from the disc rather than the hard drive, hit F2 when you see the initial boot screen. Then go to the "Boot" tab and verify that your external CD/DVD drive takes precedence over the internal SSD. While we're in the BIOS, let's hop over to the "Advanced" tab and set "OS Installation" to "Start". This will increase the chances that your external drive will be recognized or something.... mine didn't work until I made that change. When you're all done with that, exit your BIOS, saving your changes. The computer will reboot, and it should access your installation disc immediately after the initial boot screen disappears. 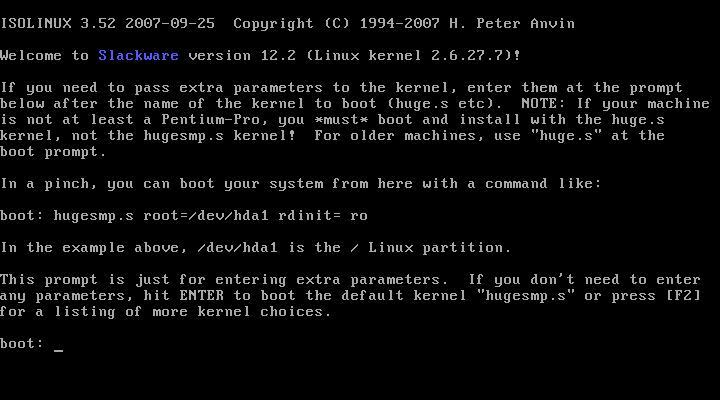 Once you boot from the installation disc, you should be presented with a screen which allows you to pass some settings to the installation kernel. This makes it so the installation will see the internal SSD as /dev/sda instead of /dev/hdc, which also boosts the read/write times by about 13 times. During the boot process you will be asked to specify your keyboard map. Unless you want something special here, just hit the enter key to proceed. cfdisk: Select the new command with the left/right arrow keys and hit enter when it's selected. Make it a primary partition, and have it take the whole SSD (3997.49MB in my case). As soon as your partitioning has finished, go ahead and run setup to begin the actual installation program. Since we don't have a swap partition, can jump straight to the TARGET option. Use the arrow keys to highlight this option and hit enter. Select /dev/sda1 from the list, and format it with ext2. On the EeePC, most people prefer this format since it is a non-journaling filesystem. That means fewer writes to the SSD, which supposedly translates to a longer lifetime. After the SSD is formatted, you will be asked to select the installation source. 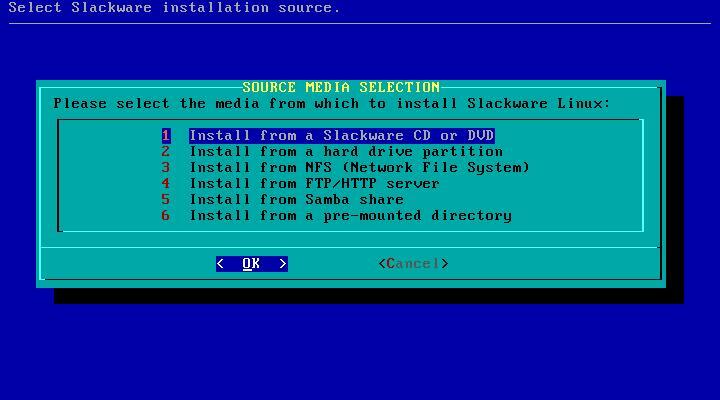 Again, I'm assuming that you want to use your fresh Slackware 12.2 disc, but you are free to choose what you want if you know what you're doing. I went with the default "Install from a Slackware CD or DVD" and told it to auto scan for my disc drive. It was found at /dev/sr0. Next, you are given the opportunity to tweak the package series which will be installed on your EeePC. I chose the following series: A, AP, K, L, N, TCL, X, and XAP. 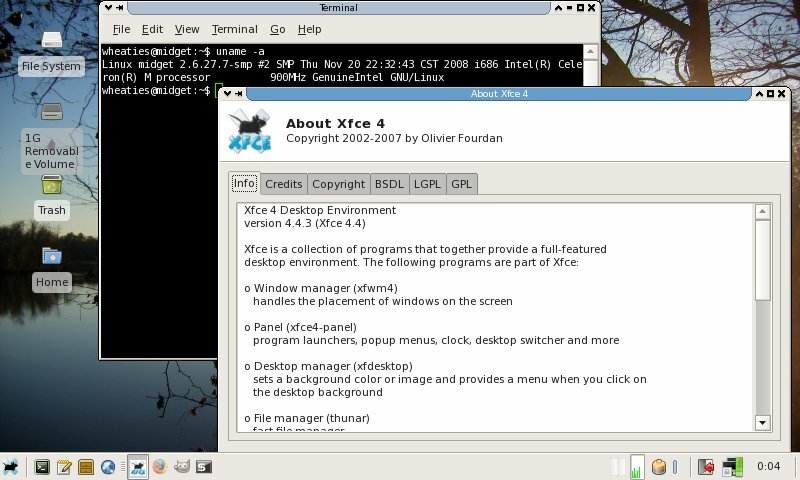 I planned on using XFCE instead of KDE on my EeePC simply because it is much more light-weight and still capable of what I need. If you want KDE, be sure to check the appropriate series. Once you mark each of the package series you wish to install, hit the "OK" button. You'll then have to choose which prompting mode to use. I chose menu, simply to be a little more picky about which packages I wanted installed. Installation took approximately 28 minutes with my package selection and setup. When all of the packages are done being installed, you will be presented with some other screens to finish up the installation process. Specify any optional kernel parameters. Ensure that the hdc=noprobe from earlier is here to speed up your system considerably. Select your preferred window manager. I chose XFCE. 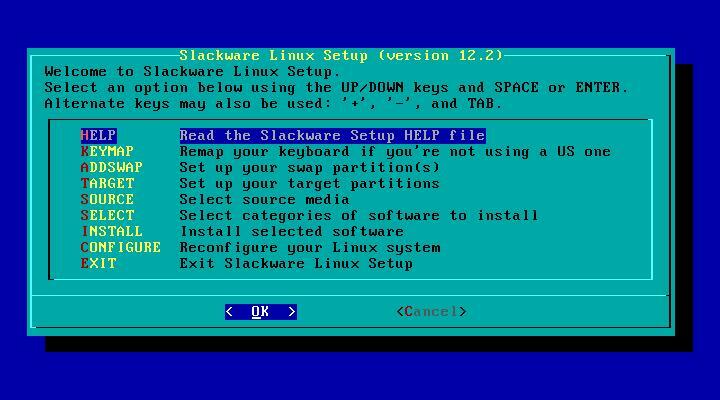 At this point Slackware has been installed on your EeePC and you can exit the setup menu and hit Ctrl-Alt-Delete to reboot your computer. You should now go back into your BIOS and set "OS Installation" back to "Finished", exit and save changes, and reboot again. 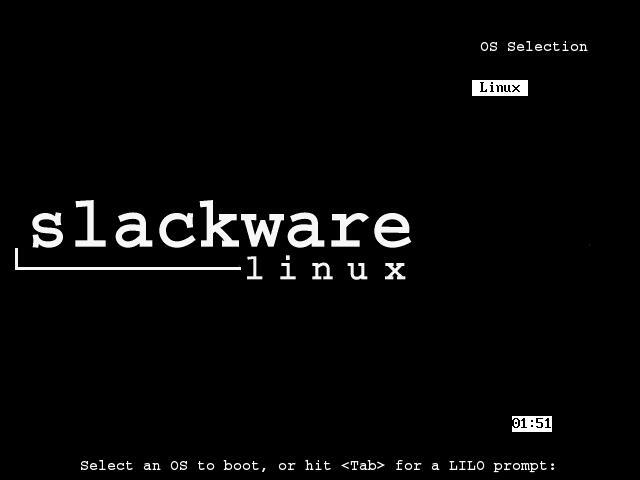 You should then see the Slackware boot screen. By default, it has a 2-minute timeout, which seems absolutely absurd to me, so we'll change that later. Just hit enter for now and watch your new Slackware boot. The first boot will usually take a bit longer than subsequent reboots because all sorts of things need to generate their first configuration file. When your system is ready, you'll be presented with a login prompt. Just login as root, using the password you specified in the last step of the installation process. This step is very important, because one thing that sets Linux apart from other operating systems is security ;). If you run your Linux system as root all the time, you're begging for problems. You can use whatever program you feel comfortable with, such as vi or nano. The next time you reboot your computer, you should see a GUI as soon as all of the services are fully loaded. Along with this step, I suppose we can mention the configuration of X Windows. I usually run xorgsetup as root to get things up and running. Usually there is also a bit of tweaking to get things like the scroll wheel on the mouse to function. This part in particular took quite some time for me to figure out. After making that change, things seemed to work a lot better. There are a couple tricks we can use to make LILO boot our EeePC slightly faster. The first is to add the compact option somewhere, and the second is to decrease the menu timeout. I also changed the line that said timeout = 1200 to be timeout = 50 to make LILO only hang around for 5 seconds instead of 2 minutes. This will tell your computer to continue booting if an IP address hasn't been assigned after 5 seconds of waiting. I have an SD card that I leave in my EeePC all the time, and it's formatted with ext2 just like the internal SSD. Without this tweak, I have to mount the SD card each time I turn on the computer, which gets bothersome. My fix is to add the SD card to /etc/fstab, which takes care of mounting the device at boot. Next, I popped the SD card back in and executed that command again. The UUID that appears the second time but not the first time is your SD card's UUID. somewhere in the file. While we're digging around in /etc/fstab, we might as well add the noatime option to the internal SSD to help reduce disk writes. Save the file and exit the editor. Then mount everything (using mount -a) or just the SD card (using mount /mnt/sd). to /etc/rc.d/rc.6 right before the "Unmounting local file systems." line (around line 195). #logger "ACPI Event $1, $2, $3, $4, $5"
These scripts should enable us to use the mute key, the increase/decrease volume keys, and the sleep key. They should also allow us to close the lid of the EeePC to put it to sleep. Occasionally, when you wake up the computer, you will just see a blank black screen. To get around this, switch back to VT2 by using the keystroke Ctrl+Alt+F2. Slackware comes with a lot of awesome stuff right out of the box, but it is missing some very important utilities at the same time. Included in this list, for me, is a program called wicd, or a network connectivity manager. This is similar to the "Network Manager" utility found in other mainstream distributions like Ubuntu, Fedora, and openSuSE. Slackware has yet to include such a utility by default. There are some utilities out there to help you in your quest to resolve package dependencies. Two of the major ones that I've used in the past are swaret and slapt-get. I have to give the Linux kernel hackers props--the 2.6.27.7 kernel is amazingly fast! I'm sure the fact that I'm running a fairly stock Slackware installation (as opposed to something like Ubuntu) helps the speed quite a bit too. This past semester I had Linux Mint 5 (XFCE edition) installed on my EeePC, and that seemed fairly responsive. 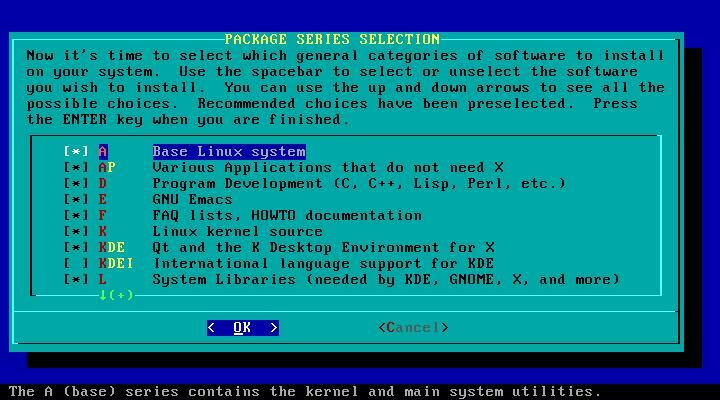 Slackware blew me away though, and I can still do everything I want to do! The webcam and sound card work out of the box, just like the wireless. I rarely use the webcam, but it's fun to play with, and my mom appreciates seeing me on Skype occasionally. The wireless connection quality exceeds what it was with the madwifi driver I was using with Slackware 12.1 and other distros like Linux Mint. Programs are ultra speedy and responsive, even with the processor clocked at 450Mhz. I love it!!! Boot times could be better, but I'm not too concerned with it. My setup takes approximately 50 seconds from boot to a useable desktop interface. Not horrible by any means, but perhaps not the best for a netbook when all you want to do is check your e-mail. I would like to see the Network Manager that so many other distributions offer in Slackware some day. The wicd application is nice, but it's not nearly as intuitive as Network Manager, and it seems to be relatively limited in its capabilities in comparison. I know I'm not alone in my desire to see Network Manager included, or at least available, for Slackware. It would be tremendously beneficial in a world where wireless networking and laptops are more and more pervasive. Using the command line to adjust your wireless connection settings each time you have to hop to a new access point is just annoying. In the end, I'm excited to have Slackware on my EeePC once again. I think it will be around for quite a while this time. Please comment with any advice or problems that you have in regards to installing Slackware 12.2 on an EeePC. I've released a new version of django-axes this morning. This project allows you to keep track of failed login attempts on your Django-powered sites quickly and easily. It pays attention to the built-in login functions for the Django administration utility as well as the stock django.contrib.auth.views.login method. If a particular user fails to login successfully after 3 tries (this number is customizable), a record is made of the failure for the site admins to review. This new version addresses what appeared to be related to some recursive function calls interpretting one failed login attempt as much more than that (sometimes more than 100 alleged failed login attempts for a single actual failed login attempt!). I also added a log file for easier access to the stuff that happens when django-axes kicks into action. Please comment with any questions, suggestions, etc you have in regards to django-axes!